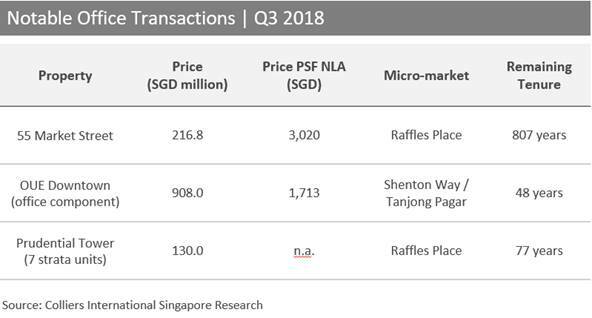 Singapore CBD Premium & Grade A rents to grow at the fastest pace since 2010 for the full 2018? Tight vacancy and muted future supply drove steep rental growth in Q3 2018 according to Colliers International Singapore Research. Colliers International Singapore Research announces that there is space pressure ahead of a supply drought in their latest Singapore Colliers’ Q3 2018 Office sector report. The report suggests that the Singapore office market looks set to end 2018 on a high amid tightening vacancy and limited stock of new space over the next three years. In particular, Colliers International anticipates that Premium and Grade A office rents in the Central Business District (CBD) could rise by 14% for the full 2018 – the first double-digit annual growth since 2011 and the fastest pace of increase since 2010. 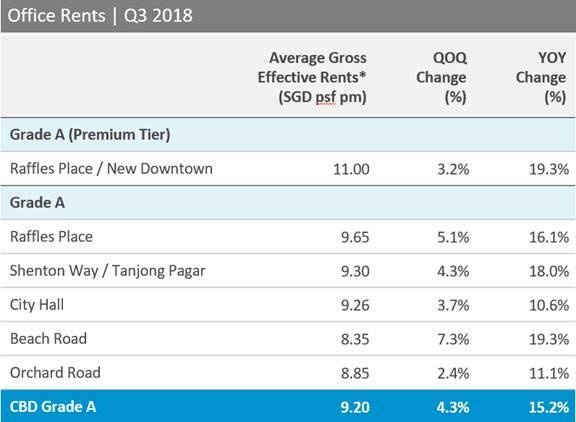 Colliers’ Q3 2018 Office sector report showed that average CBD Premium and Grade A rents rose 4.3% quarter-on-quarter (QOQ) to SGD9.20 per square foot per month (psf pm) in the three months to 30 September, following a 2.6% QOQ growth in Q2 2018. On a year-on-year (YOY) basis, average CBD Premium and Grade A rentals increased by 15.2% in Q3. Strong headline rent growth and declining incentives probably underpinned the uplift in effective rents during the quarter, noted Colliers Research. Cumulatively, CBD Premium and Grade A rents have climbed by 12.1% in the first nine months of this year. In Q3 2018, CBD Premium and Grade A vacancy remained flat, rising by 0.1ppt QOQ to 5.6%. Colliers expects the prime office supply pipeline to taper significantly over 2019-2021, with new supply averaging 0.57 million sq feet (53,000 sq metres), or 2% of stock per annum, in contrast to the large supply injection in 2017 (approximately 10% of stock). The office supply drought over 2019-2021 should keep CBD Grade A vacancy tight, below the 10-year average of 6.2%, even after accounting for the impact of slowing net absorption in 2020 and 2021 in accordance with consensus forecasts of a global economic dampening. Colliers Research found that the primary drivers of growth in the office property sector in Q3 were financial, insurance and business services, as well as the wholesale and retail trade industry. Meanwhile, the office investment market saw lower overall volumes in Q3 2018 due to smaller deal sizes transacted during the quarter. The rolling 12-month volumes of office and mixed-use commercial transactions fell 28% QOQ to SGD3.83 billion, according to Colliers Research. Some notable office transactions in Q3 included: 55 Market Street; the office component of OUE Downtown; and seven strata units at Prudential Tower. In particular, 55 Market Street was transacted at a record low cap rate (1.7%) for a 999-year leasehold asset, underscoring the weight of institutional capital chasing core opportunities at elevated valuations. In Q3 2018, the average imputed capital value of CBD Grade A office properties rose 2.2% QOQ to SGD2,401 (USD1,756) per sq foot. CBD Grade A implied yields remained flat, ranging between 3.2% and 3.8% on average.